The imposing and beautiful City Palace in Udaipur, Rajasthan, on the shores of Lake Pichola was the residence of the Maharanas of Mewar. It is really a palace complex, with different Maharanas having added to the original palace over 300 years. 76 generations of the Maharanas, who are Sesodia Rajputs, have ruled Mewar but Udaipur was founded late in the 16th century. 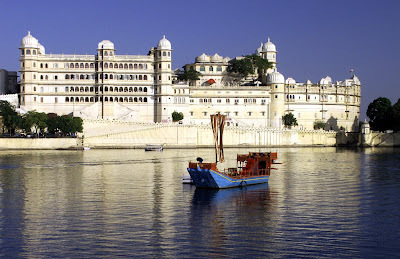 According to Travel & Leisure magazine, Udaipur is the top city in the world for vacations, with Bangkok being second. In all there are seven palaces, each linked together, and each with traditional Rajput military construction providing grandeur to the vast complex. Access to the City Palace is also through three defendable gates: Bari Pol (Great Gate), Tripolia (Triple Gate), and Hathi Pol (Elephant Gate). While the palace interiors have design features from different time periods, like beautiful mosaics of peacocks, silver-work, Chinese and European ornamental tiles, inlay-work, gorgeous chandeliers, crystal furniture and crockery, and brilliantly mirrored bedchambers. The entire complex is the property of the Mewar royal family and a number of trusts take care of the running and maintenance of the structures. The construction material for the City Palace is marble and sandstone from the Sajjangarh mines. The architectural marvel of pristine Hindu construction is seen in the large stone blocks being interlocked together without the use of mortar; this was common in all Rajput buildings which have stood for centuries. For more intricate balconies, turrets, and brackets, the local Udaipur artisans used traditional mortar made by mixing limestone soaked in water with river sand. Another kind of mortar was aarish/ghutai, made by mixing finely ground limestone with egg shells, pulses and colour. This traditional mortar not only kept the palace complexes standing, but also kept the interiors cool.